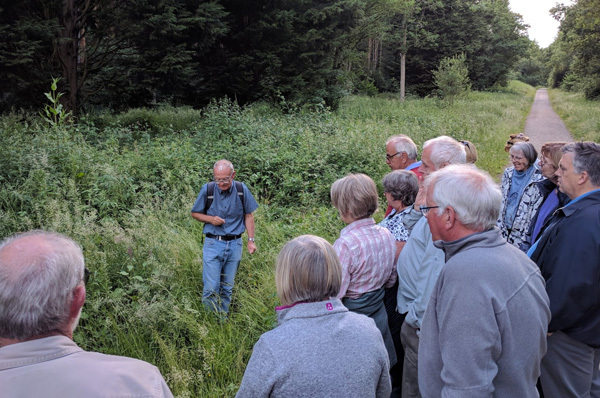 Around 20 people joined Dr Richard Jefferson for the wild flower and grasses walk he led for the Friends of Bourne Wood. It was a lovely sunny evening, and we had a gentle stroll looking at least 40 species of plant, grass, shrub and tree. Around 20 people joined Dr Richard Jefferson for the wild flower and grasses walk he led for the Friends of Bourne Wood. We started with some common shrubs such as Elder and Hazel, and then discussed Herb Robert and the origination of its common name (from an Abbot!). 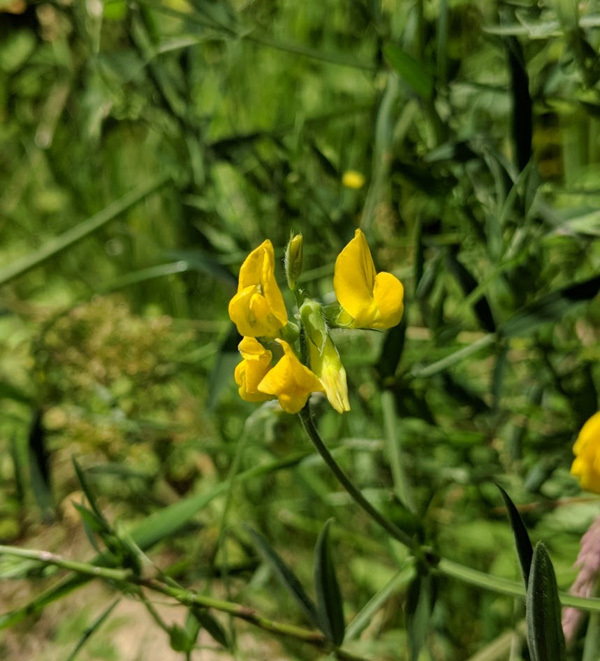 Richard described the difference between a Dog Rose and a Field Rose, and we looked at white clover and its cousin, red clover which is preferred by bees. 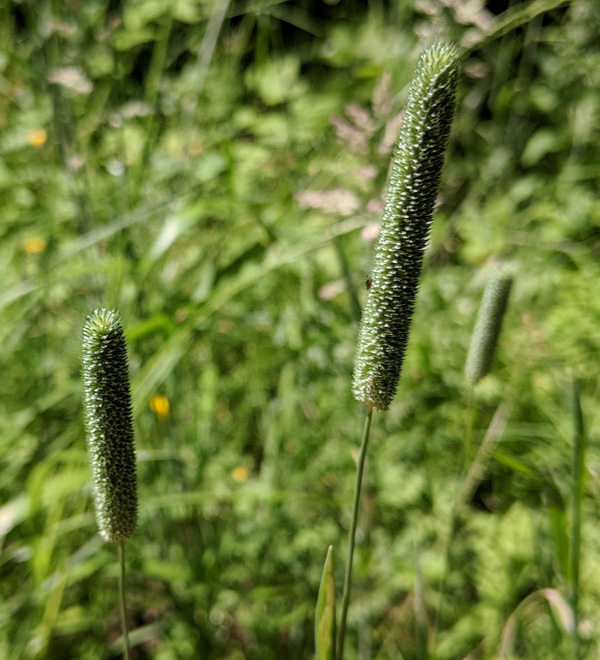 The long, dense flower spikes of Timothy grass are cylindrical in shape and sit atop a tall, slender stem. Its leaves are grey-green and flat. Looking at grasses we saw the perennial rye-grass which is used commonly in agricultural grasslands and sports fields, false oat grass, and tufted hair grass along with Yorkshire Fog. We then looked at the Wild Service tree (the symbol of the Friends of Bourne Wood), which is normally found on woodland edges, and the Wych Elm which is more resistant to Dutch Elm Disease. 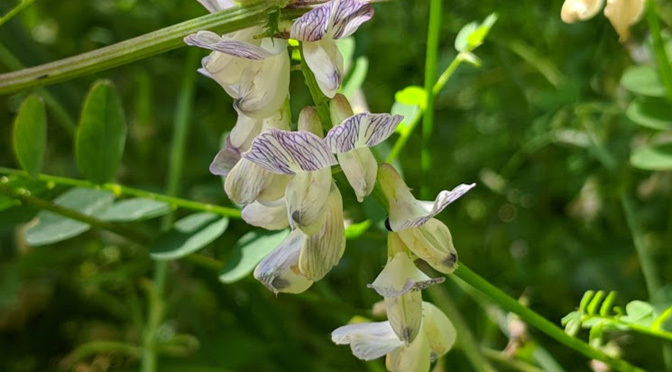 We admired the beauty of the sprawling Wood Vetch, and the common spotted orchid, and looked at the unusual sight in the wood of Vipers Bugloss (not a woodland plant). We found corn mint which is now a rare plant (although it seems common in the wood), and marsh bedstraw. 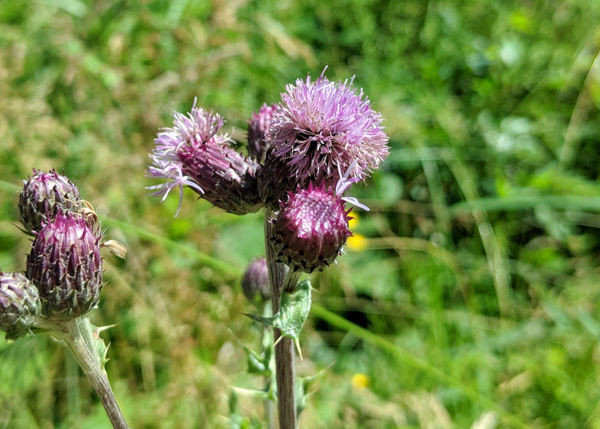 The Creeping Thistle has flower heads with lilac-pink florets (tiny flowers) on top of a small cylinder of spiny bracts (leaf-like structures). Its leaves are divided and spiny, and its stems do not have wings. Like most thistles, it produces masses of fluffy, wind-borne seeds in late summer. Thanks go to Richard for an enjoyable and informative walk.